The space shuttle Discovery is seen docked to the International Space Station in this camera view on Aug. 31, 2009 during the STS-128 mission. The Leonardo cargo module can be seen tucked in the shuttle's payload bay. Thisstory was updated at 10:13 p.m. EDT. It was movingday at the International Space Station Monday as astronauts installed a cargomodule packed full of fresh supplies, science gear and a treadmill named after comedianStephen Colbert. The cargomodule arrived at the station late Sunday aboard the shuttle Discovery andis crammed with 8 tons of equipment for the orbiting laboratory?s six-personcrew. ?It lookslike a giant canister from the outside,? said Discovery astronaut PatrickForrester in a NASA interview. ?I like to think of it almost like a movingvan.? Discoveryastronauts and the station crew used the orbiting laboratory?s robotic armto pluck the nearly 14-ton Leonardo cargo module from the shuttle payload bayand attach it to an open berth on the outpost. The move took about threehours and astronauts plan to enter the cargo pod in the wee hours of Tuesdaymorning. Packedinside the cargo module are sophisticated science experiments to study newmaterials and fluid physics. A new air-scrubbing device to clean the station?sair and an astronaut bedroom are also stowed aboard Leonardo along with otherscience gear and supplies. A treadmillnamed after TV comedianStephen Colbert, of Comedy Central?s ?The Colbert Report,? 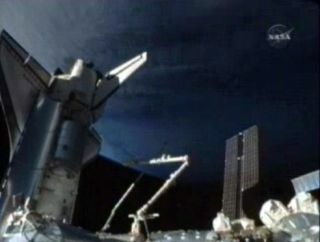 will also bemoved into the space station by Discovery?s crew. NASA named the treadmill forColbert as a consolation prize after he won an online poll to have a new spacestation room named after him earlier this year. NASA named that roomTranquility instead, but dubbed the treadmill the Combined Operational LoadBearing External Resistance Treadmill, or COLBERT. The COLBERTtreadmill launched to the space station in a myriad of pieces stored in severalbags that will be moved to a storage berth inside the station. It will takeastronauts about 20 hours to assemble the treadmill, but they won?t touch theexercise gear until at least mid-September, after the arrival of a new unmannedJapanese cargo ship, NASA officials have said. Discoveryastronauts are slated to begin hauling cargo out of Leonardo on Tuesday andprepare to load it up with trash and other unneeded items to be returned toEarth. ?There?salways a challenge in that,? Forrester said. ?It would be as if a moving vanshowed up at your house full and somehow you needed to get everything off ofthat into your house, and then everything in your house back into that movingvan, and so there?s a little bit of a shell game going on.? LeRoy Cain,NASA?s deputy shuttle program manager, said Discovery?s heat shield appears tobe in good health with respect to launch debris. Engineers cleared the shuttle?sheat shield for re-entry pending a final standard inspection just beforelanding to check for any new damage from space debris or micrometeorites. Engineers arealso working to certify a method of using Discovery?s larger reaction controlthrusters to move the entire linked shuttle-station structure when required.Discovery cannot fire its smaller thrusters, which are normally used at thestation, because one has a leak. After the shuttle docked at the stationSunday, the station used its own Russian-built thrusters to move the two linkedspacecraft, but consumed more propellant than normal. ?What we?rereally talking about doing is just trying to do the most efficient thing forboth the shuttle and the station,? said Cain, who likened the differentattitude control systems on the shuttle and station to having three cars athome, and one has more fuel efficiency than the rest. ?We?re trying to be smartabout what we?re doing and evaluate the options that we have.? The spacestation has plenty of fuel for its Russian thrusters and has NASA-builtgyroscopes that use no propellant whatsoever, Cain said. NASA wants to have aplan in place on which system to use, the station?s or Discovery?s, duringundocking and in case the linked spacecraft need to dodge space junk, Cainsaid. In additionto moving in at the station today, Discovery astronauts will also prepare forthe first of threespacewalks of their mission. That spacewalk, aimed at removing an old - buthuge - ammonia coolant tank from the station and retrieving a Europeanexperiment, is scheduled to begin late Tuesday. SPACE.comis providing complete coverage of Discovery's STS-128 mission to theInternational Space Station with Managing Editor Tariq Malik and Staff WriterClara Moskowitz in New York. Clickhere for shuttle mission updates and a link to NASA TV.